For fleet managers considering the popular Ford F-150 pickup truck, Westport now offers two alternative fuel options. Introducing a new dedicated, liquid propane system, along with Westport’s compressed natural gas (CNG) package for 2016 Ford 5.0L F-150 trucks. Both fuel options are part of the Westport WiNG™ Power System and are expected to be certified to EPA and CARB standards. 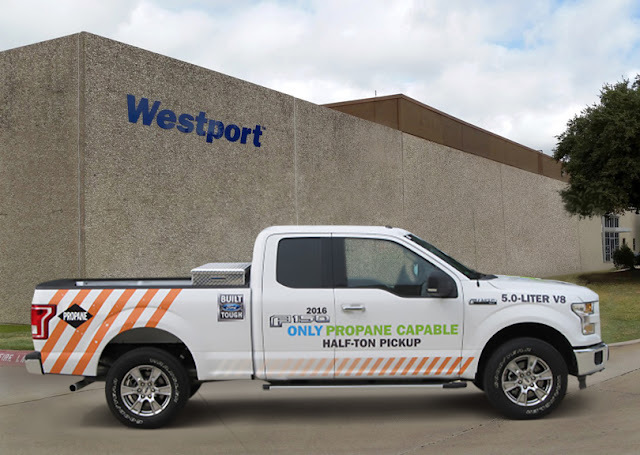 While most liquefied petroleum gas (LPG or propane) offerings in the market today take up valuable truck bed space, Westport's tank packages will be located underbody, thereby creating additional capability and productivity for fleets. consistent volumetric efficiency resulting in superior power and emissions when compared to existing vapor propane systems. best overall throttle response than any other propane fuel system technology. Westport is taking advantage of Ford’s new natural gas and propane gaseous-prep package, which is now available on MY2016 vehicles. Designed to transport passengers and cargo, the 2016 Ford F-150 offers a 5.0 L engine with improved emissions compared to gasoline. The new aluminum alloy body reduces the weight of the truck by as much as 700 lbs. In addition, the existing Ford OEM warranty remains intact. For more information about the Westport WiNG™ Power System visit westport.com/wing or contact FordSales@westport.com.